Home » Uncategorized » We’re Hiring! 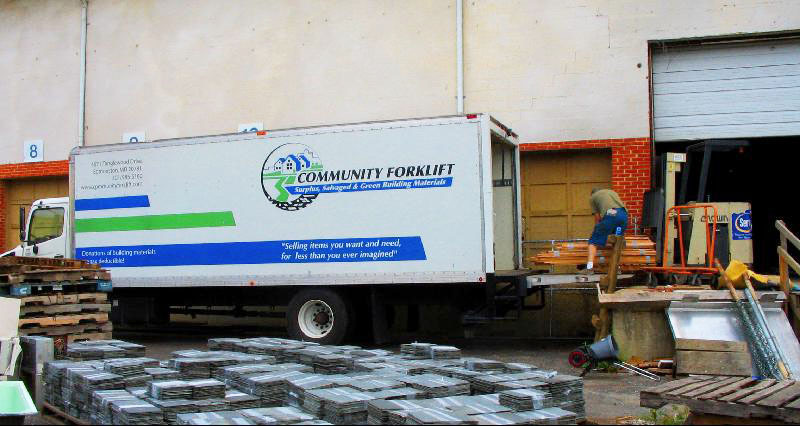 Community Forklift (CF) is seeking a part-time Truck Helper to work with our growing green business. This person will represent the organization by picking up used and surplus building materials in the DC metro area. Responsibilities include picking up building materials from a wide variety of sites including homes, construction sites and other difficult to access areas and unloading them at Community Forklift. Strong English speaking skills, bilingual Spanish speaking skills a plus! Community Forklift is a nonprofit reuse center for home improvement and architectural salvage. The store accepts donations of new, gently-used and vintage building materials; these donated renovation supplies are then made available to the public at low prices and donated to local nonprofits. Community Forklift is located outside Northeast DC, near the Hyattsville Arts District. Send: 1) resume, 2) cover letter, and 3) three professional references by email to COOCommunityForklift(at)gmail.com, by mail to Truck Helper Position, c/o Community Forklift, 4671 Tanglewood Drive, Edmonston, MD 20781; or by fax to (301) 985-5182.